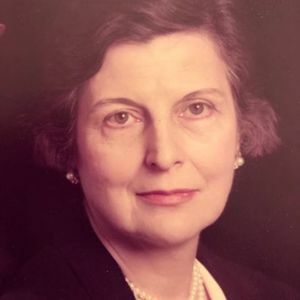 Rose Dawn Engel, 96, of Westfield, passed away on April 6, 2019, at Garden Terrace Nursing Home in Chatham, NJ. She was predeceased by her loving husband of 55 years, Walter R. Engel, in 2010. Rose, who was also known by her middle name, Dawn, was born March 29, 1923 in Derby, CT to Biagio and Barbara Spina. She lived on Staten Island, NY with her parents and her brother George (deceased), and graduated from Curtis High School. As a young adult during World War II, Dawn served as a volunteer with the Travelers Aid Society, USO in Grand Central Station. She attended New York University and the Fashion Institute of Technology. Prior to her marriage, she held executive assistant positions in New York with Markt & Hammacher Company and Virginia-Carolina Chemical Corporation. In 1955 Dawn and Walter married and settled in Westfield where they raised their family and remained longtime residents. Over the years, Dawn held memberships in The Rake and Hoe Garden Club of Westfield, Overlook Auxiliary Twig #12, and The Woman's Club of Westfield. Dawn and Walter together had been active members of the First Congregational Church of Westfield. Dawn served on the Board of Deacons and participated in the many antiques shows held as fundraisers at the church. She also taught church school for ten years. Among her hobbies were watercolor and oil painting, gardening, golf, bridge and cooking. Gatherings of family and friends at her home were always a special pleasure. Dawn is survived by her three children, Laurence and his wife Karin of Westfield, Barbara Tomalonis and her husband William of Chatham, and Robert and his wife Kristin of Chatham. Of great joy to her were her eight grandchildren, Gregory, Christopher and Elizabeth Engel; Katharine and William Tomalonis; Justin, Jacquelyn and Matthew Engel; and two great-grandchildren, Sebastian and Gwen Engel. Dawn and Walter made donations to many charities over the years including those to veterans groups, medical research, church, hospitals, local and educational institutions, and special purpose children's camps and support groups. In lieu of flowers the Engel Family requests that memorial contributions be made to a charity of the donor's choice. Dawn's visitation will be from 2-4 and 7-9PM Wednesday April 10th at Gray Funeral Home, 318 E. Broad St., Westfield, where visitation will begin at 10AM Thursday April 11, 2019, followed by her Service of Remembrance at 11:00AM. Interment will follow in Fairview Cemetery, Westfield. Please go to: www.grayfuneralhomes.com to offer condolences.